IOTA’s Boulevard planters were selected for The Lexicon shopping centre, at the heart of the £240m town centre regeneration of Bracknell’s Northern Retail Quarter. This was a sizeable project, and a total of 84nr. 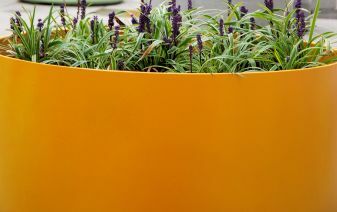 planters were supplied of the Boulevard DELTA 45 Trough design. The DELTA 45 Trough is a large capacity trough, which is available in five lengths from 60cm up to 140cm, with the height and depth always 45cm. The planters feature throughout the centre; and are used, in particular, to define and green outside dining areas for two of the anchor food outlets – Carluccio's restaurant, and the Mason + Rye bakery-patisserie-café of Fenwick department store. Opened in September 2017, The Lexicon centre creates a mix of open and covered public streets, lined with contemporary retail units, and complemented by a vibrant selection of restaurants, cafés and bars fronting new public squares. The scheme is part of a £240m town centre regeneration masterplan; an initiative which has seen the demolition and redevelopment of a third of the old town centre, originally built as part of a new town development in 1949.